Minnesota Duluth is the 2019 NCAA men's ice hockey national champion after winning the Frozen Four in Buffalo. The Bulldogs defeated Massachusetts 3-0 on Saturday to earn a second-straight national title in its third-straight national championship game. In the first semifinal, Minnesota Duluth beat Providence 4-1 to advance to the title game. In the Thursday's second game, Massachusetts held off a Denver comeback that forced overtime to advance to the Minutemen's first-ever title game appearance. The official tournament bracket, schedule and scores are below. Recap all the action from our on-site blog, below. Click or tap right here to open up a printable version of the tournament bracket pictured below in a new tab or window. To view the live interactive active bracket, click here. 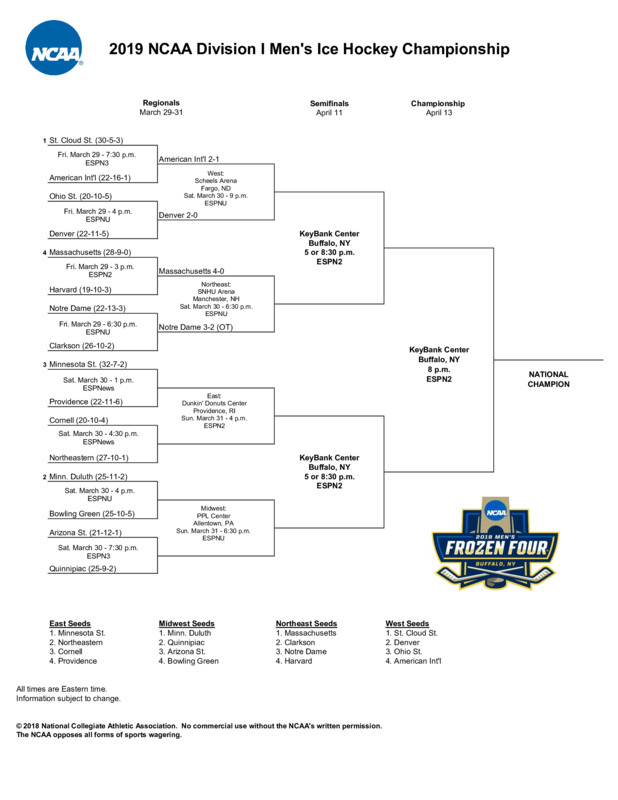 Check out the past winners of the NCAA men's hockey tournament.